You may think that cataracts are something you don’t have to worry about until you reach your 60s or 70s, but cataracts actually can start forming in your 40s and 50s. Cataracts affect about 24.4 million Americans age 40 and older. And nearly half of all Americans have developed the condition by age 75. Although there are some risk factors you can’t control, like increasing age or a family history of cataracts, there are steps you can take to lower your risk and delay or slow cataract development. As you get older, the lenses in your eyes become less flexible and transparent and get thicker. Tissue within the lenses breaks down and forms clumps, which create cloudy spots on the lenses. Over time, the cloudy area gets more dense and covers more of the lens. Cataracts scatter and block the light as it tries to pass through the lens, which makes the images that reach your retina less sharply defined. The end result is blurry or dimmed vision, increasing trouble seeing at night or in low light, sensitivity to light and glare, halos around lights, faded or yellowed color vision, and in some cases double vision. Don’t smoke: If you’re currently a smoker, talk with your doctor about smoking cessation counselling and medications that can help you quit. 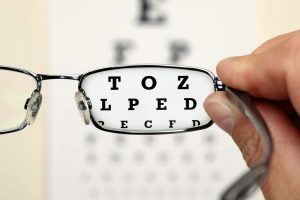 Stay up-to-date with eye exams: For most people, a comprehensive eye exam every two years for people under 65 and every year after 65 can help detect cataracts and other vision problems at an early stage. Ask your ophthalmologist how often you should be getting your eyes examined. Moderate your alcohol consumption: If you drink alcohol, do so in moderation. For women, that’s one drink per day; for men, up to two drinks per day. Manage your blood sugar and blood pressure: Studies have found that people with diabetes are at a higher risk of developing cataracts and tend to develop them at a younger age, so controlling your blood sugar is essential. If you have high blood pressure, take any medications your doctor has prescribed to lower it and make lifestyle changes like choosing a healthy diet, getting regular exercise, and managing stress to get your blood pressure to normal levels. Wear sunglasses and a hat: Choose a wide-brimmed hat and sunglasses that block 100% of UV rays when spending time outside. The sunglasses should have a tag that says they meet ANSI UV requirements. Eat a healthy diet: Some studies have found that people who eat a diet rich in yellow and dark leafy green vegetables that contain higher levels of the antioxidants lutein and zeaxanthin have a lower risk of developing cataracts than those who eat the least amount of these foods. Omega-3 fatty acids, found in some fish, nuts, seeds, legumes, and greens, also have been associated with a lower risk. And eating foods high in antioxidants, including beta-carotene, selenium, and vitamins C and E, may lower your risk.